I am delighted to be able to support the work that Bridge2Aid is doing in Tanzania. Providing training in vital skills to local people means that the organisation is strengthening the healthcare infrastructure of my country. Producing long-term positive change on the scale that Bridge2Aid has done means that they continue to provide access to prevention and pain relief for millions of people over many years. I am proud to endorse their work and excited to see the change that they are continuing to bring to Tanzania. Dr.Migiro was recently appointed Ambassador by H.E. Dr. John Pombe Joseph Magufuli, the 5th President of the United Republic of Tanzania. 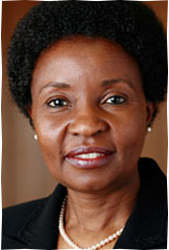 Dr.Migiro is the immediate past Deputy Secretary-General of the United Nations. Appointed on 1 February 2007 she was the first African woman to be appointed to that position since its establishment in 1997. She finished her tenure at the end of June 2012. Before being appointed to the United Nations Dr.Migiro served as Minister of Foreign Affairs and International Cooperation from 2006-2007 — the first woman in the United Republic of Tanzania to hold that position since its independence in 1961. Prior to this she was Minister for Community Development, Gender and Children for five years. From 2014-2015 Dr.Migiro served as Minister for Constitutional and Legal Affairs, appointed by the 4th President of the United Republic of Tanzania, H.E. Dr. Jakaya Mrisho Kikwete. Prior to Government service, Dr.Migiro pursued a career in academia. She was a member of the Faculty of Law at the University of Dar-es-Salaam from 1982 to 2000, where she rose to the rank of Senior Lecturer. She headed the Department of Constitutional and Administrative Law from 1992 to 1994, and the Department of Civil and Criminal Law from 1994 to 1997. As a medical practitioner, administrator and teacher; and during my time as Minister for Health and Social Welfare, I have been keenly aware of the damage and pain that oral diseases and lack of dental treatment cause in individuals and communities. Bridge2Aid is a charity that I have witnessed making a tangible, long-term change in the health infrastructure in Tanzania. By training rural health workers in emergency dentistry skills Bridge2Aid is empowering local communities and by so doing making a difference. I am proud to be associated with an organization that is promoting truly sustainable solutions with such passion and integrity. 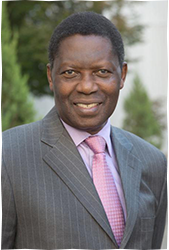 Professor David Homeli Mwakyusa. Professor Mwakyusa worked as the Shinyanga District Medical Officer in Tanzania before joining the teaching faculty at the Dar es Salaam University Medical School where he held the position of professor. He was chair of the department of internal medicine and for eight years he served as the director of administration and hospital services at Muhimbili, the national hospital which incorporated the medical school. He served as Minister for Health and Social Welfare in Tanzania for 5 years. It is a great honour to be asked to be a Patron of Bridge2Aid Australia. As the organisation grows so does the capacity to help those in the developing world improve their oral health. The hard work and generosity of highly qualified Bridge2Aid volunteers in providing education, resources and skills to local healthcare workers is admirable. I encourage all to support the tremendous work and enthusiasm of the volunteers so that they may achieve their vision of access for all to emergency dental care. 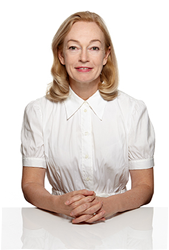 Professor Heitz-Mayfield received a Masters in Periodontology (1996) and Odont Dr (1998) from Lund University, Sweden. She received a scholarship at the Brånemark Osseointegration Centre, Sweden, and was awarded an ITI scholarship at the University of Berne, Switzerland where she became Head of the Oral Microbiology Research Laboratory, from 1999-2003. Received the André Schroeder Research Prize in Implant Dentistry. Professor Heitz-Mayfield is active in research in implant dentistry and periodontology and has lectured extensively both nationally and internationally. Her current positions include Adjunct Professor at the International Research Collaborative, Center for Oral Health and Equity, The University of Western Australia, The University of Notre Dame, Associate Professor at The University of Sydney, and at The University of Hong Kong. Chair of the ITI Research Committee, and member of the ITI Board of Directors. Editor in Chief of Clinical Oral Implants Research. Maintains a specialist periodontal practice in Perth, Western Australia.